Welcome to Loughton Karate Club where we practice the Wado Ryu style of karate. Martial arts movie icons Bruce Lee and Jackie Chan have inspired thousands to try their hands at combat sports. Even if you've never seen Enter the Dragon or Karate Kid, there are plenty of reasons for taking up martial arts. As a form of exercise, taking part in karate, can be more challenging than other activities. More exciting than lifting weights or jogging on a treadmill in the gym. With a wide range of techniques to learn, you are unlikely to get bored. Karate training is a great way of building your confidence whilst the high energy workout that comes with it can help to keep stress levels down. 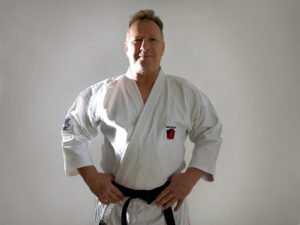 Contrary to what some people think, developing karate skills doesn't make you more aggressive. In fact because of the discipline involved, it has the opposite effect. At Loughton Karate Club, we welcome people of all ages and abilities to train with us during our classes throughout the week. Beginners can start throughout the year. Translates into English as ‘The Way of Peace and Harmony’. Our style of karate originates from Okinawa and was founded by Hironori Otsuka in 1934. It is a fast flowing, evasive style which combines the punches, kicks and blocks of karate with throws, locks and grappling of jujitsu. Wado ryu was brought to England by Tatsuo Suzuki in the 1960's. Literally meaning ‘empty hand’, karate is a traditional Japanese martial art. Established in 1922, the founder, Gichin Funakoshi described the practice as ‘the development of character’. In essence, an unarmed-combat system, using kicks, strikes, throws and defensive blocks and with a strong emphasis on mental attitude and discipline. Karate developed with underlying principles of self-discovery and self-improvement. The ultimate aim of karate training was to aspire to live by a set of core beliefs and values including courage, loyalty, self-control, honour and justice. Martial arts today are usually modified for modern sport and exercise but many karate styles still have their emphasis on the core values. We also run self-defence workshops and training sessions for businesses with staff at risk dealing with the general public such as schools and hospitals. Loughton Self-Defence. I have spent virtually my whole life studying martial arts under the tuition of world renowned instructors. Since childhood, I have practised 3 different styles of karate alone before settling with Wado Ryu. I currently hold a black belt 4th dan in this style. Over the years, I have also trained in many weapons arts such as jo staff, samurai sword and knife. My experience is not just limited to the Japanese fighting arts. I travelled to Thailand to learn Muay Thai and studied Kickboxing, Tai Chi, MMA and Escrima here in the UK. As a professional, full time instructor, I regularly teach 6 days a week in schools and at our evening/weekend venues. I am a qualified first-aider, carry an Enhanced DBS Certification and regularly attend Safeguarding/Child Protection courses. I'm also a Level 3 Qualified Personal Trainer. Both myself and the club are fully insured with Martial Guard.